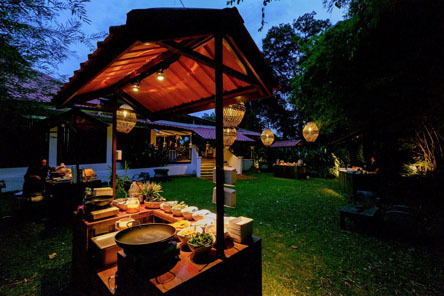 Housed within a heritage colonial bungalow encircled by verdant greenery, lend a distinctive flair to your event at Tamarind Hill. Pairing authentic Thai cuisine with warm service, our dedicated planners and award-winning culinary team have decades of experience creating successful events. From product launches to corporate dinners, and from birthday celebrations to night markets, let our team of experienced planners create a memorable event for you and your guests. For bookings and enquiries, please contact our event specialists at +65 6270 1868 or email events.sg@tamarindrestaurants.com.